The Central Pacific has many important national and private protected areas. These pristine green zones provide sanctuary for many endangered species. The two most well known areas, Carara National Park and Manuel Antonio National Park, are readily accessible natural laboratories that nature lovers will enjoy immensely. Carara National Park borders the Tarcoles River. 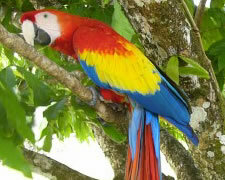 This transitional zone encompasses several ecosystems and harbors an incredible variety of wildlife including the largest population of Scarlet Macaws in Costa Rica. Just past Carara on the left is a road leading up to the mountain to Villa Lapas. Following this road another eight kilometers through rich forest and past breathtaking views brings you to a small tourist complex called La Catarata (The Cascade). Here you can take a four-hour trek on horseback through a private, reforested cattle ranch to a magnificent waterfall. Along the way you'll see several expansive vistas and are likely to spot scarlet macaws, toucans, and monkeys. Herradura Beach is a small, quiet, protected cove with just enough infrastructures to make it comfortable. Sport fishing charters, visits to Tortuga Island, and romantic sunset tours round out a full fare of water-related activities including snorkeling, wind surfing, and water skiing. Jaco Beach is what Herradura isn't. This is where "Ticos" traditionally come to play in the sun. There's plenty of infrastructure, shopping, nightlife and accommodations to provide anything one might want in a beach vacation. 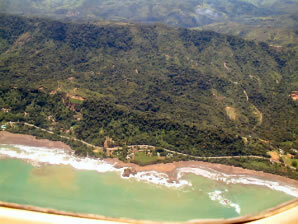 view looking down on the long expanse of Playa Hermosa. There are many uncrowded beaches along this stretch, and many gravel roads provide access to these oases with names like Esterillos Oeste, Bejuco, and Palma.